Beadnell Bay is one of north Northumberland's best kept secrets. The views are fantastic and on a clear day you can see Dunstanburgh Castle and even the Cheviot Hills! 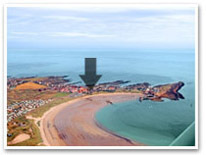 The horse-shoe shaped beach is one of the county's very best in terms of cleanliness, safety and accessability. It provides a haven for families to enjoy the traditional delights of a sea-side holiday, as well as a starting point for those of a more adventurous disposition. 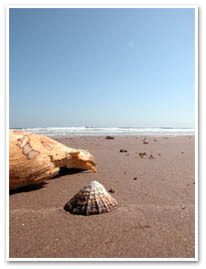 Beadnell beach is renowned locally for its range and quality of watersports. Sea Kayaking, wind surfing, pony-trekking and dinghy sailing are all available nearby. For the keen scuba diver, Beadnell is the ideal base to explore the myriad of wrecks and under sea treasures, which lie off the Northumberland coast. A gentle stroll along the beach to the recently refurbished harbour is a nice way to unwind after a day's exploring - the same walk will reward the early bird with the opportunity to witness a spectacular sunrise over the sea. The harbour also provides an ideal location for safe fishing for anglers of whatever level of experience. Beadnell beach is truly the jewel in Northumberland’s seaside crown  with the beach literally on the doorstep, Water’s Edge is the perfect location to enjoy and explore this magnificent stretch of unspoilt coastline.